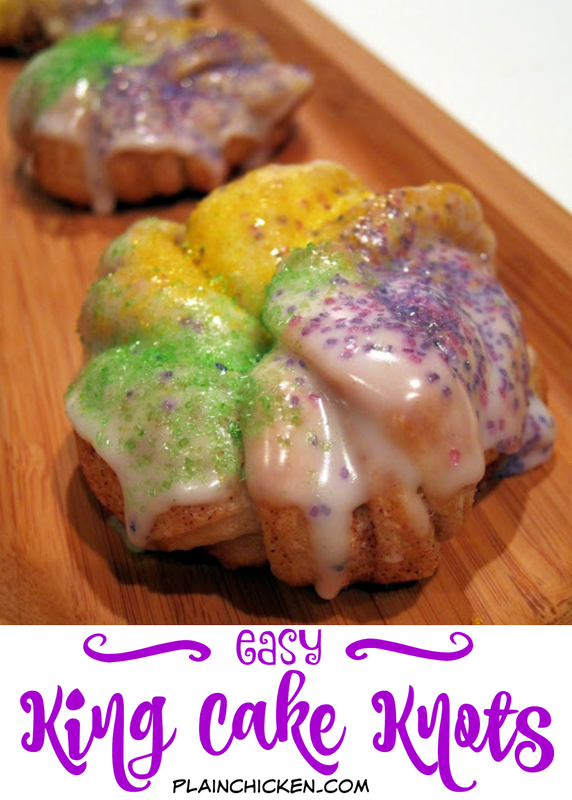 Easy King Cake Knots - refrigerated french bread dough coated in cinnamon and sugar, baked and topped with a quick homemade icing and colored sugar. Perfect for Mardi Gras!! 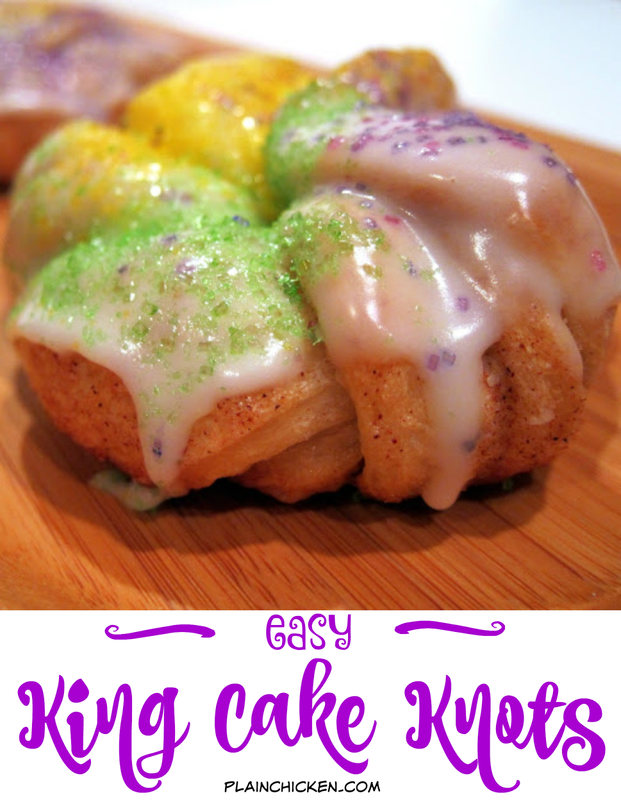 I made these easy mini king cakes to go with our Slow Cooker Jambalaya, because no Mardi Gras celebration is complete without King Cake. I really like king cake, but I don't want to spend all day kneading dough and waiting on it to rise. This recipe uses refrigerated french bread dough and only takes a few minutes to assemble. We had just enough time to recover from dinner before we gobbled these up. These would even be good for breakfast. Unroll french bread dough into a large rectangle, about 16 by 12 inches. Brush the dough lightly with softened butter. Mix together sugar and cinnamon. Sprinkle over butter. Cut the dough in half lengthwise and then cut crosswise into strips about 1 1/4 inches wide. Twist two stips together. Tie each strip loosely into a knot, stretching gently if necessary, and place on baking sheet about 2-inches apart. Bake for 25-28 minutes. Cool. Mix together powdered sugar, milk and vanilla. Dip each knot into icing and then sprinkle with colored sugar. Great, quickie recipe. It looks wonderful. Every year someone in our office orders a king cake that's shipped up from New Orleans. And every year I wonder, why would anyone want more than a bite of this? So cute! And they fit into my "good things simple" lifestyle! I could make these. Always love your recipes! WOW these look sooo good and look so cute! Love this idea! They turned out so pretty too! They look great. So festive. If you get a chance, visit my blog. I am having a giveaway. Have a great weekend. I made these today! Delish! Very cute and easy to boot! King cake?!?!! I have never heard of such a thing! It sounds so interesting! I'm so glad I checked out your blog today because I will be making these tonight to bring to our cook up at the parade tomorrow!! Happy Mardi Gras!! Great idea! Seems easy and doable! My boyfriend and I are obsessed with king cake, so we'll try this out soon! I'm featuring these in my blog post. Stop over and link up your post in my New Orleans link up as well as any of your other post. All are welcome. I already have your post on Pinterest but will pin all other post linked up! Thank you! I'm making these because I think you have them on my Pampered Chef Bamboo Cracker Tray and that is what sold me! I can see exactly how small and cute they are! These look amazing! Do you have any recommendations for the bread dough? Thanks so much! Can't wait to make these! Looks yummy! Any pictures of the dough "un"baked in the twist form? Made these for breakfast without the frosting. A great quick little treat.